In October 1955, aged 71, Guy Maunsell eschewed retirement and established a consultancy firm that would have global recognition — G. Maunsell & Partners. He set up temporary offices at 17 Queen Anne's Gate, in London's Westminster, in premises owned by Sir Alexander Gibb & Partners. He formalised the new partnership with a written statement of its philosophy, in which the opening sentence was, "It is recognised that the first duty of the partnership is to serve the interests of the clients". He also vowed that the company would treat contractors "with sympathy and consideration" and that, "In the matter of internal relationships between partners, associates and employees, our basic idea is to deal openly and fairly". Maunsell was the managing senior partner and his other four much younger partners were 38 year-old John Baxter, 33 year-old Len Ramage, 29 year-old Miles Birkett and 28 year-old Peter Stott. The fledgling firm had 11 members, known as the First Eleven — all previous Maunsell, Posford & Pavry staff. There were two more engineers (John Read and Dudley Sewell), two draughtsmen (David Weller and Harry Howard), one artist/tracer (Sylvia Welton) and Maunsell's secretary Mrs Patterson. 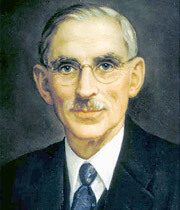 Cyril Stapley Chettoe (1893-1963), retired chief engineer with the Ministry of Transport, joined as a consultant later in 1955. The regard Maunsell had for his staff is shown by the fact that when his daughter Rosalie married in 1956, everyone in the company was invited. The post-war, and in Britain post-rationing, era of the mid 1950s was a period of worldwide infrastructure rebuilding and increasing prosperity. Wartime innovations, often necessitated by shortages, and emerging techniques such as prefabrication and precasting were driving advances in construction. High tensile steel was replacing mild steel for reinforcement and was also suitable for use in prestressed concrete, which permitted much longer spans in beams and slabs than reinforced concrete, and used lesser quantities of materials. Prestressed concrete was pioneered by French engineer Eugène Freyssinet (1879-1962), through his discoveries and tests while researching the effect of creep in concrete. Creep is the movement, deformation and changes that occur in concrete over time when it is under stress. To counteract creep, pretensioned high tensile steel wires are placed inside the concrete instead of, or in addition to, steel reinforcing bars. Freyssinet took out a patent for prestressed concrete in 1928 and first used it in 1934 on the strengthening of Le Havre Maritime Station (completed 1933), which had been in danger of collapse from ongoing settlement. He also invented precast segmental construction for prestressed bridges, as typified by the Luzancy Bridge (1941-46) on the Ile de France. It was perfect timing for G. Maunsell & Partners to demonstrate their expertise in highways and transportation, using the new prestressing techniques and becoming well known for their roads and bridges. For the first three years of operations there were few UK contracts, possibly because Maunsell and his partners focused on quality of service rather than profitability, but this dearth was compensated for by plenty of work overseas, particularly bridge projects in Australia. The majority of early road bridges around the world were constructed in timber or masonry. In Australia, timber bridges have tended to last well because the slow-growing local hardwoods used are extremely durable. Timber bridge building started there in the late 18th century, with trussed structures appearing in the 19th and early 20th centuries. By the mid 1950s, timber bridge construction dwindled, partly because the large diameter trees required were becoming scarce, though the cost of maintenance and repair was also an issue. Reinforced and prestressed concrete offered an economic and almost maintenance-free alternative. In May 1955 Ernie W. Godfrey, Chief Bridge Engineer, was part of a group from the Main Roads Department in Western Australia who visited Europe to study recent bridge development and select a consulting engineer. This was prompted by his dissatisfaction with the aesthetics of a design prepared by his own department for the Narrows Bridge (1957-59) over the Swan River in Perth. G. Maunsell & Partners was appointed consulting engineers for the contract in April 1956. The 335m long Narrows Bridge carries a six-lane highway connecting Perth to its suburbs south of the river and with the Perth-Kwinana Freeway. It is a five-span precast prestressed bridge, 27.4m wide with a central span of 97.5m, formed from eight beams side-by-side and continuous over their full length. To satisfy the elegant design of the structure, the steel prestressing cables had to occupy minimal space and none of the branded systems available, from Freyssinet to Roebling, were suitable. So external cables were used, which allowed the web thickness to be minimised. The bridge is founded on 180 concrete piles cast inside steel tubes, each is 46m long and 800-1100mm in diameter. G. Maunsell & Partners designed the structure with architect Sir William Holford & Partners. Prestressing work was by consulting engineers E.W.H. Gifford and construction by Christiani & Nielsen in conjunction with local firm J.O. Clough & Son. Building began in April 1957 and the bridge was opened by General Sir Charles Henry Gairdner (1898-1983), Governor of Western Australia, on 13th November 1959. It had cost £1.5m and at the time it was the largest prestressed concrete bridge in the world, plus the first in Australia to be constructed segmentally and with external prestressing cables. The success of the finished bridge, still in use, led to more major bridge contracts in Australia. In 1956, G. Maunsell & Partners were awarded the design contract for a new bridge over the Derwent River at Hobart (Tasman Bridge, 1960-64). It was a project that had been mooted in 1952 when Chettoe, then at the Ministry of Transport, recommended Maunsell to the Public Works Department of Tasmania in connection with reporting on the condition of the existing floating bridge over the river, which was prey to storm damage. Maunsell advised a high-level bridge as a replacement, but had to wait four years until the scheme could be funded. The construction contract was signed by Commissioner of Main Roads J. Digby Leach on 16th March 1957. Baxter was made managing partner of G. Maunsell & Partners in 1957, which was a busy year for the company. Birkett moved to Australia to establish a branch office of the firm in Melbourne in June, where he worked on bridge designs with Baxter, Stott and Sewell. Over time as staff numbers increased, Australian engineers went to work in the London office and vice versa. 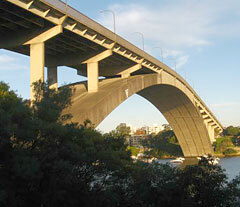 Among other things, Birkett was responsible for the supervision of the construction of the Gladesville Bridge (1959-64) in Sydney and the Tasman Bridge. At the same time, the partners were exploring the possibilities of work elsewhere in the world — Baxter and Stott saw the 1958 revolution in Iraq at first hand. In the same year, the firm designed the Oyster Creek Bridge to carry a road between Serekunda and Banjul in the Gambia. It was located in a silty delta next to the Atlantic Ocean, so had to be founded on piles — soon dubbed 'Gambia piles' — whose innovative in-house design used reinforced concrete cast inside a permanent steel sleeve, with the driving hammer acting inside the sleeve. The same piling technique was used subsequently on the Narrows Bridge and the Tasman Bridge. The Oyster Creek Bridge was replaced by the 210m long Denton Bridge in 1985-86. Though design work commenced in 1956 and the contract was signed in 1957, construction of the Tasman Bridge did not begin until April 1960. The first two lanes opened to traffic on 17th August 1964, with full opening of all four lanes on 23rd December that year. The floating curve of the old bridge, with its opening mid-span, was removed on 18-19th August. Contractor for the £7m project was Reed, Braithwaite, Stuart & Lipscombe from Salisbury, England. The 22 span structure is 1.4km long and 17.4m wide. Its main navigation arch has a clear span of 73.2m with some 46m clearance above the mean river level to allow shipping to pass beneath. The piers are founded on 216 Gambia piles 1.3m in diameter, extending down to a maximum of 81m below mean water level. The bridge was in constant use until the evening of 5th January 1975, when the bulk ore carrier SS Lake Illawarra hit the structure — two piers and 127m of the deck collapsed, and 12 people were killed. G. Maunsell & Partners were consultants for the rebuilding and the contractors were John Holland. The $44m (Australia changed her currency from pounds to dollars in 1966) project started in October 1975 and the bridge was widened to five lanes before it re-opened on 8th October 1977. When it was completed in 1964, the 579.4m long Gladesville Bridge in Sydney had the longest single span concrete arch ever constructed and was esteemed as one of the city's most spectacular bridges. It replaced the original 1881 bridge over the Parramatta River, which carried just one lane of traffic in each direction plus a tramway and featured a swing section at its southern end. This could be opened for sailing ships and steamers with high funnels to pass through. Traffic congestion by the mid 1950s meant that a new bridge was imperative. This has one continuous steep arch instead of an opening section to give the required clearance. G. Maunsell & Partners was responsible for the design, with chief engineer J.A.L. Shaw replacing H.M. Sherrad in April 1962, and the contractors were Reed & Mallik Ltd from Salisbury with local firm Stuart Brothers. The consultants were Freyssinet, Yves Guyon and Jean Muller. The original design was for a steel cantilever but when Freyssinet was presented with Maunsell's alternative, he recognised the engineer's talent for pushing the boundaries of concrete bridge construction and approved the design. The structure’s arch has four prestressed concrete box ribs spanning 305m with a clearance of 40.7m above the water. The ends of the arch are constrained by concrete thrust blocks embedded into the sandstone bedrock. Each rib was constructed from precast sections, supported on piled formwork, and eased into place by inflatable gaskets that were then filled with concrete. This technique had been used previously by Freyssinet. After that the pairs of vertically stressed slender piers were built atop the arch to support the 25.6m wide waffle beam deck, which carries six lanes of traffic and two footways. Work on site began in December 1959 and the bridge opened to traffic on 24th October 1964. It was widened to accommodate eight lanes in the 1970s. The design reflects the growing awareness at the time that form should be as important as function. Structures were expected to harmonise with their surroundings, whether landscapes or cityscapes. Bridges had a new kind of aesthetic — elegant and slender continuous spans were achievable more readily in concrete than other materials. 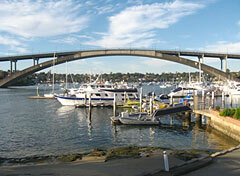 Gladesville Bridge was Maunsell's last major project in Australia. Sadly, he would not live to see it completed. He retired officially in 1959, suffering ill health following a heart attack. He and his wife moved from their farm at Hildenborough to a house called The Orchard, on London Road, Southborough in Kent, between Tonbridge and Tunbridge Wells. In Britain, the 1950s was characterised by increasing road traffic and the building of related infrastructure. Ordinary people could now afford their own cars and they had a much better road network to drive on, especially with the advent of motorways. G. Maunsell & Partners was determined to be part of the adventure. Preston Bypass, the first section of motorway in Britain (later part of the M6), opened on 5th December 1958 and the initial stretch of the M1 was opened on 2nd November 1959 by Maunsell's friend the Transport Minister (Albert) Ernest Marples (1907-78). Marples also founded the road contractor Marples, Ridgway & Partners Ltd in 1948 with Reginald Ridgway (1908-2002). In 1958, G. Maunsell & Partners secured the design contract for the Hammersmith Flyover (1959-62), a long elevated road viaduct in west London (now part of the A4) that was the first British precast post-tensioned concrete structure. With civil engineer and soil mechanic (Charles) Peter Wroth (1929-91, later Professor), Maunsell made good use of his bridge experience with prestressed concrete and designed an assemblage of elements constructed segmentally, then prestressed together (post-tensioned). Precasting offsite helped minimise land use on the congested site. The contractor was Marples Ridgway, whose engineer F.S. Jackson designed the gantry that placed the units. The four-lane flyover links the Great West Road and the Cromwell Road extension (1956). The original plan was to use reinforced concrete spans carried on piers comprising a row of columns across the entire width at each point of support. Maunsell, as chief engineer, insisted on using prestressed concrete so that a slender concrete superstructure could be carried on single central columns of modest dimensions at each support. This was an attractive and practical solution as it reduced the area of unusable land beneath the viaduct. Maunsell did not live to see the flyover completed, but his pioneering design was continued by his partners — Baxter and Stott in particular — and it is still well used today. This one structure brought G. Maunsell & Partners to the forefront of UK concrete design. Though the design work was expensive, the construction costs were far lower than for a traditional reinforced concrete structure. Maunsell’s health continued to decline and he died at home on 20th June 1961, aged 76. He was buried at Southborough Cemetery on 23rd June. Tributes to his technical prowess from fellow engineers and architects included one from Sir Hugh Beaver, who had encouraged Maunsell to become a consultant in 1935. He wrote of Maunsell that, "He had a remarkable and inventive brain and it was only his own modesty that prevented him being known outside the engineering world as well as he should have been. It is not possible to deny that he did not suffer fools easily ... but I must say that I look back on the years I was working with Guy Maunsell as some of the most pleasant and most productive in my life". Maunsell's resolve and determination in the face of adversity served him well during his lifetime. After his death, the company won numerous contracts for new roads and highway infrastructure, including Europe's longest elevated concrete roadway, the Westway (1966-70), and established a global reputation in Australia and Hong Kong. By the late 1990s the firm was the third largest civil engineering consultancy for transportation in the world. Gladesville Bridge (1959-64) across the Parramatta River in Sydney, by G.Maunsell & Partners, with Freyssinet, Yves Guyon and Jean Muller as consultants. Its 305m single span concrete arch was at the time of construction the longest ever built. The bridge deck is 579.4m long. The original intention for Gladesville Bridge was a steel cantilever but when Freyssinet was presented with Maunsell's alternative, he recognised the engineer's talent for pushing the boundaries of concrete bridge construction and approved the design. Early design work on the concrete arch was carried out by Maunsell's employee Tony Gee, using the Ferranti Pegasus computer later used for calculations on the Sydney Opera House shells. This bridge is the first major structure in the world designed with the aid of a computer. 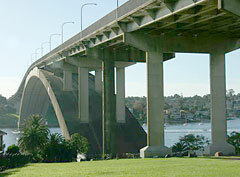 Gladesville Bridge's arch consists of four prestressed concrete box ribs, with the ends constrained by concrete thrust blocks embedded in the bedrock. Arch segments were brought by river an installed over formwork, with hydraulic fluid-filled gaskets in place. These were used to lift the arch away from its formwork, and the fluid was then replaced with liquid concrete. The main deck is a concrete waffle slab.